Written by PJ Lobster House on April 4, 2019 . Posted in Blog, Dinner, Holidays, Specials. Easter Sunday dinner is an excellent way to celebrate the holiday, while also bonding with loved ones. Instead of preparing a complicated meal that takes time away from the holiday, mark your calendars for Easter Sunday dinner at PJ Lobster House! Let us cover the food, so you can spend time with loved ones and celebrate Easter. To learn more about our Easter Sunday dinner, just keep on reading. The PJ Lobster House Easter Sunday dinner special is delicious and affordable. For only $55, you can enjoy an all inclusive menu for two. This meal includes two soups or salads, one appetizer to share, two entrees, and one dessert to share. For the soup or salad, select from Manhattan clam chowder, New England clam chowder, our famous lobster bisque, french onion soup, or a house salad. Start your Easter Sunday meal off right with any of these selections. Next, order from our wide range of appetizers to share with your family. We have everything from spinach dip, to shrimp cocktail, to boneless wings, to a seafood salad, to clams oreganata. All of our entrees are available with the choice of one side. For your Easter Sunday dinner, consider the lobster roll, which includes a fresh lobster salad made with hand picked lobster meat, mixed with fresh celery and Hellmann’s mayonnaise, served on a toasted New England style hot dog bun. We also serve crispy fish taco-dillas, featuring your choice wrapped with a cool cilantro lime slaw by a cheese quesadilla, cajun swordfish, tempura battered chicken, and beer battered cod. Our black angus burger is another popular choice, made from an 8 oz burger and served with your choice of toppings. Available sides include french fries, mashed potatoes, waffle fries, seasoned rice, sweet potato fries, creamed spinach, and so on. For your Easter Sunday dessert, consider pie, a cookie skillet, sorbet, creme brulee, cheesecake, ice cream, or a sundae. 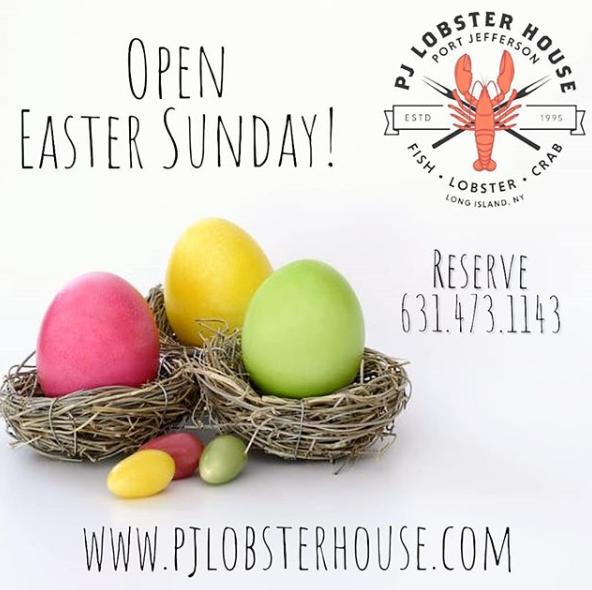 We hope you will enjoy an Easter Sunday dinner with us at PJ Lobster House. To make your reservation today, call 631-473-1143.